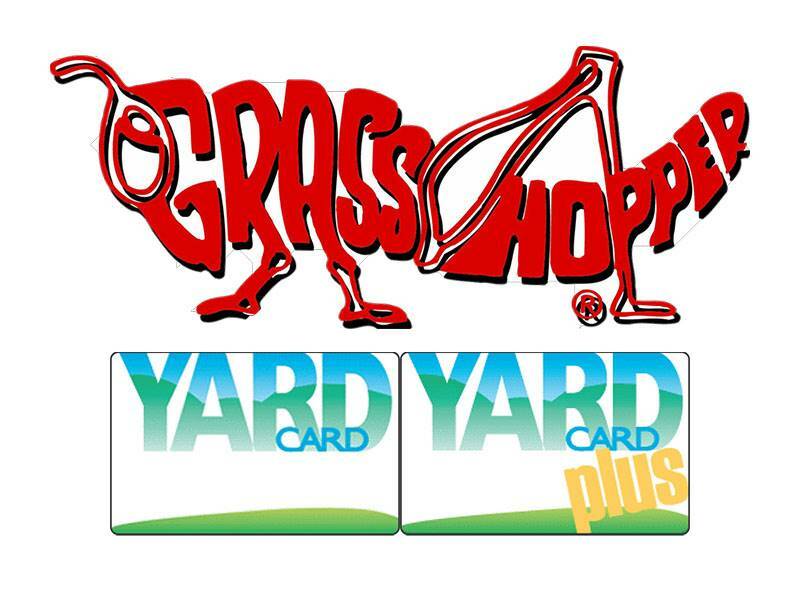 Yard Card programs are available at dealers throughout all 50 states and the District of Columbia. Most programs may not be combined with other Grasshopper seasonal promotions. See your dealer about other promotions and finance options available. Programs subject to revision or cancellation without notice. Payment Calculator does not apply to the Yard Card program. Yard Card terms contain Monthly Payment information. Minimum purchase requirement of $1,500. There is a promotional fee of $125 for this transaction. Offer subject to credit approval. *No Interest for 54 Months with Equal Payments: Minimum purchase amount of $1500 is required to qualify for this offer. There is a promotional fee of $125 for this transaction. The monthly payment is calculated by dividing the purchase amount and the promotional fee amount by the number of months in the offer and will pay off the balance if all payments are made on time. Other transactions, including fees and other charges, may affect your overall monthly payment amount. This is a limited time offer. Standard account terms apply to non-promotional purchases. New accounts: Standard Purchase APR 29.99%. Minimum interest charge $1. Existing account holders, see your credit agreement for applicable terms. This offer may not be combined with other special financing offers. Prior purchases excluded and account must be in good standing. Offer subject to credit approval on a Yard Card credit card account. See store associate for more information. *No Monthly Interest for 54 Months with Equal Payments: A minimum purchase amount of $1,500 is required. A one-time promotional fee of $125 will be charged to the account for this transaction. During the 54 month promotional period a minimum monthly payment is required that is calculated by dividing the purchase amount and the promotional fee by the length of the promotional period. The promotional period will start on the date of purchase. Interest will not accrue during the promotional period. If the purchase amount, plus any applicable fees or charges is not paid in full by the end of the promotional period, interest will be charged at the APR for purchases on any remaining balances until paid in full. The current APR for purchases is 28.99%. APR for purchases on existing accounts may vary between 20.49%-29.99%. Minimum interest charge $2.00. Offer subject to credit approval on a Yard Card Plus credit card account. *No Interest for 48 Months with Equal Payments: Minimum purchase amount of $1500 is required to qualify for this offer. There is a promotional fee of $125 for this transaction. The monthly payment is calculated by dividing the purchase amount and the promotional fee amount by the number of months in the offer and will pay off the balance if all payments are made on time. Other transactions, including fees and other charges, may affect your overall monthly payment amount. This is a limited time offer. Standard account terms apply to non-promotional purchases. New accounts: Standard Purchase APR 29.99%. Minimum interest charge $1. Existing account holders, see your credit agreement for applicable terms. This offer may not be combined with other special financing offers. Prior purchases excluded and account must be in good standing. Offer subject to credit approval on a Yard Card credit card account. See store associate for more information. rest charge $2.00. Offer subject to credit approval on a Yard Card Plus credit card account. *No Interest for 36 Months with Equal Payments: Minimum purchase amount of $1500 is required to qualify for this offer. There is a promotional fee of $125 for this transaction. The monthly payment is calculated by dividing the purchase amount and the promotional fee amount by the number of months in the offer and will pay off the balance if all payments are made on time. Other transactions, including fees and other charges, may affect your overall monthly payment amount. This is a limited time offer. Standard account terms apply to non-promotional purchases. New accounts: Standard Purchase APR 29.99%. Minimum interest charge $1. Existing account holders, see your credit agreement for applicable terms. This offer may not be combined with other special financing offers. Prior purchases excluded and account must be in good standing. Offer subject to credit approval on a Yard Card credit card account. See store associate for more information. *No Monthly Interest for 36 Months with Equal Payments: A minimum purchase amount of $1,500 is required. A one-time promotional fee of $125 will be charged to the account for this transaction. During the 36 month promotional period a minimum monthly payment is required that is calculated by dividing the purchase amount and the promotional fee by the length of the promotional period. The promotional period will start on the date of purchase. Interest will not accrue during the promotional period. If the purchase amount, plus any applicable fees or charges is not paid in full by the end of the promotional period, interest will be charged at the APR for purchases on any remaining balances until paid in full. The current APR for purchases is 28.99%. APR for purchases on existing accounts may vary between 20.49%-29.99%. Minimum interest charge $2.00. Offer subject to credit approval on a Yard Card Plus credit card account. *1.90% APR with 60 Monthly Payments: A minimum purchase amount of $1500 is required. There is a promotional fee of $125 for this transaction. We determine your monthly payment amount by applying the reduced APR to the sum of your purchase amount and promotional fee amount and then dividing that amount by the number of months in the offer. This will pay off the balance if all payments are made on time. Other transactions, including fees and other charges, may affect your overall monthly payment amount. This is a limited time offer. Standard account terms apply to non-promotional purchases. New accounts: Standard Purchase APR 29.99%. Minimum interest charge $1. Existing account holders, see your credit agreement for applicable terms. Offer may not be combined with other special financing offers. Prior purchases excluded and account must be in good standing. Offer subject to credit approval on a Yard Card credit card account. See store associate for more information. *1.90% APR with 60 Payments: A minimum purchase amount of $1,500 is required. A one-time promotional fee of $125 will be charged to the account for this transaction. The Reduced APR of 1.90% will apply to the purchase for the 60 Month promotional period. A minimum payment equal to 1.75% of the purchase amount is due each month. If the purchase amount, plus any applicable fees or charges, is not paid in full by the end of the promotional period, interest will be charged at the current APR for purchases until paid in full. The current APR for purchases is 28.99%. APR for purchases on existing accounts may vary between 20.49%-29.99%. Minimum interest charge $2.00. Offer subject to credit approval on a Yard Card Plus credit card. *2.99% APR with 54 Monthly Payments: A minimum purchase amount of $1500 is required. There is a promotional fee of $125 for this transaction. We determine your monthly payment amount by applying the reduced APR to the sum of your purchase amount and promotional fee amount and then dividing that amount by the number of months in the offer. This will pay off the balance if all payments are made on time. Other transactions, including fees and other charges, may affect your overall monthly payment amount. This is a limited time offer. Standard account terms apply to non-promotional purchases. New accounts: Standard Purchase APR 29.99%. Minimum interest charge $1. Existing account holders, see your credit agreement for applicable terms. Offer may not be combined with other special financing offers. Prior purchases excluded and account must be in good standing. Offer subject to credit approval on a Yard Card credit card account. See store associate for more information. *2.99% APR with 54 Payments: A minimum purchase amount of $1,500 is required. A one-time promotional fee of $125 will be charged to the account for this transaction. The Reduced APR of 2.99% will apply to the purchase for the 54 Month promotional period. A minimum payment equal to 1.97% of the purchase amount is due each month. If the purchase amount, plus any applicable fees or charges, is not paid in full by the end of the promotional period, interest will be charged at the current APR for purchases until paid in full. The current APR for purchases is 28.99%. APR for purchases on existing accounts may vary between 20.49%-29.99%. Minimum interest charge $2.00. Offer subject to credit approval on a Yard Card Plus credit card. *3.99% APR with 54 Monthly Payments: A minimum purchase amount of $1500 is required. There is a promotional fee of $125 for this transaction. We determine your monthly payment amount by applying the reduced APR to the sum of your purchase amount and promotional fee amount and then dividing that amount by the number of months in the offer. This will pay off the balance if all payments are made on time. Other transactions, including fees and other charges, may affect your overall monthly payment amount. This is a limited time offer. Standard account terms apply to non-promotional purchases. New accounts: Standard Purchase APR 29.99%. Minimum interest charge $1. Existing account holders, see your credit agreement for applicable terms. Offer may not be combined with other special financing offers. Prior purchases excluded and account must be in good standing. Offer subject to credit approval on a Yard Card credit card account. See store associate for more information. *3.99% APR with 54 Payments: A minimum purchase amount of $1,500 is required. A one-time promotional fee of $125 will be charged to the account for this transaction. The Reduced APR of 3.99% will apply to the purchase for the 54 Month promotional period. A minimum payment equal to 2.02% of the purchase amount is due each month. If the purchase amount, plus any applicable fees or charges, is not paid in full by the end of the promotional period, interest will be charged at the current APR for purchases until paid in full. The current APR for purchases is 28.99%. APR for purchases on existing accounts may vary between 20.49%-29.99%. Minimum interest charge $2.00. Offer subject to credit approval on a Yard Card Plus credit card. *5.99% APR with 48 Monthly Payments: A minimum purchase amount of $1500 is required. There is a promotional fee of $125 for this transaction. We determine your monthly payment amount by applying the reduced APR to the sum of your purchase amount and promotional fee amount and then dividing that amount by the number of months in the offer. This will pay off the balance if all payments are made on time. Other transactions, including fees and other charges, may affect your overall monthly payment amount. This is a limited time offer. Standard account terms apply to non-promotional purchases. New accounts: Standard Purchase APR 29.99%. Minimum interest charge $1. Existing account holders, see your credit agreement for applicable terms. Offer may not be combined with other special financing offers. Prior purchases excluded and account must be in good standing. Offer subject to credit approval on a Yard Card credit card account. See store associate for more information. *5.99% APR with 48 Payments: A minimum purchase amount of $1,500 is required. A one-time promotional fee of $125 will be charged to the account for this transaction. The Reduced APR of 5.99% will apply to the purchase for the 48 Month promotional period. A minimum payment equal to 2.33% of the purchase amount is due each month. If the purchase amount, plus any applicable fees or charges, is not paid in full by the end of the promotional period, interest will be charged at the current APR for purchases until paid in full. The current APR for purchases is 28.99%. APR for purchases on existing accounts may vary between 20.49%-29.99%. Minimum interest charge $2.00. Offer subject to credit approval on a Yard Card Plus credit card.